Concern for poverty in Africa is coming from the most unexpected places lately: the boardrooms of fossil fuels companies. Multimillionaire fossil fuel execs, like Exxon’s Rex Tillerson and Peabody’s Charles Meintjes, are painting themselves as Africa’s saviours, claiming that fossil fuels are the answer to Africa’s poverty and development problems. The often explicit corollary of their seemingly benevolent “carbon humanitarianism” is that fossil fuel divestment activists and those pushing for a clean energy future are killing the African dream to develop. In response, it is worth showing why the opposite is true, and why my fellow Africans should join the fossil fuel divestment and climate justice movement. To start off, let’s be clear, the fossil fuel divestment movement is not asking for the immediate cessation of fossil fuel use, but rather for a just transition away from dirty and harmful fossil fuel energy. Furthermore, the movement is grounded in principles of climate justice which recognise that developed countries have much more significant responsibilities to reduce their greenhouse gas emissions than developing countries. Nonetheless, the African continent has much to gain by moving quickly past outdated modes of fossil fuel energy production. Just as much of the continent skipped past reliance on landlines and moved straight to mobile phone use, so Africa can largely but not entirely leapfrog outdated modes of fossil fuel reliance. What’s more the economics of doing so are lining up faster than most realise. 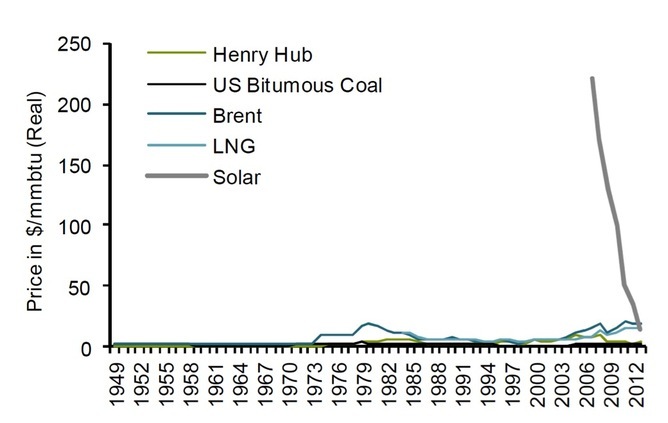 Unlike Miley Cyrus, renewable energy is really coming in like a wrecking ball as the graph below powerfully illustrates. Onshore wind-power is already competitive or cheaper than other fossil fuels even when subsidies are excluded. Likewise solar is already cost-competitive across much of the African continent and is set be cost-competitive with coal power in 80% of the world by 2017 as Deustche Bank predicts. The devastation this changing reality is wreaking on the fossil fuel industry’s business model is set to deepen for while the price of renewable energy continues to plummet, fossil fuels are getting more expensive as they become increasingly difficult to extract. Even the National Bank of Abu Dhabi, situated in the heart of the oil-rich Gulf, has reported that renewables are the future for the Middle East as they are already cheaper and more reliable than oil. That same report, from the world capital of cheap oil, shows that even at $10 per barrel for oil, and $5 per a million British thermal units for gas, solar is still their cheapest option. What’s more, such a trend is not only limited to the sunny Middle East, as scientists at the Finnish Lappeenranta University have calculated that China would see increased economic growth if it were to make a large scale transition to renewable energy. Similar results have been shown in not-so-sunny Germany where modeling by physicists Hans-Martin Henning and Andreas Palzer have shown that with “no decrease in the standard of living, in comfort levels or in mobility” it is economically to Germany’s advantage “to move as quickly as possible to a system of 80% renewable energy” for their entire energy system, not just electricity. As the International Energy Agency (IEA) points out, if the world transitions to clean energy in line with the internationally agreed upon target of two degrees above industrial levels that would result in net savings on fuel and energy costs of $71 trillion by 2050. And the IEA is the farthest thing from a placard-waving conference-attending green activist trying to impose under-development on Africa. Rather, in the words of philosopher Clive Hamilton, it “is a staid organisation that for years has shared the worldview of oil and coal industry executives. It is the last international body that could be accused of green sympathies, other than the Organisation of Petroleum Exporting Countries”. So when even one of the fossil fuel industry’s biggest cheerleaders admits that staying stuck on fossil fuels is pretty darn expensive, why would the African continent cling to outdated fossil fuel energy production? Perhaps it is because we can’t bring renewable energy to scale fast enough? Such a claim is supported by self-serving projections from companies like Exxon which claim that the world will only be providing 3% of its energy from wind and solar by 2040. 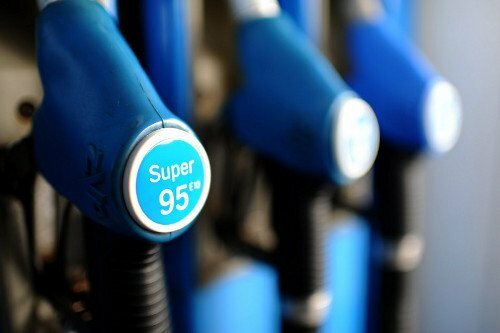 It’s a testament to the fossil fuel industry’s PR power that it has much of the world believing that we just can’t do without fossil fuels when 80% of global energy industry experts believe that the world’s electricity system can be 70% renewable by 2050, and almost half of them believe that we can achieve 70% in just 15 years. The fossil fuel divestment movement is about breaking that power and recognising that we can do so much better than achieve 3% renewable energy by 2040, as Exxon, Shell and their morally bankrupt fossil-fuelled kin may like to see us do, the planet and its people be damned. We have the ability to significantly scale up clean energy, and unlike many fossil fuels, which rely on a centralised energy production model, clean energy holds the promise of a cost-effective decentralised energy future that brings power into the hands of people all across the African continent, even to those who have typically been overlooked by centralised fossil fuel energy models. Furthermore, as Robert Polin has shown, “spending on green investments creates approximately three times as many jobs as spending on maintaining our existing fossil fuel infrastructure”. That’s a much needed boost to employment, especially in countries like South Africa, which faces ~25% unemployment levels. What’s more a transition to clean energy also provides huge savings of increasingly precious water resources, the prevention of significant air, soil and water pollution, and avoided ecological degradation. Add all of that up and it becomes clear that a clean energy future simply makes sense for the African continent. What’s more some of you have hopefully noticed that I have not really mentioned climate change as a reason why Africa should transition to clean energy. That is in part to show that clean energy pays for itself without even considering climate change. But, of course, an increasingly urgent reason for the African continent to join the clean energy transition is that the costs of climate change on the African continent will be vast and devastating. On one hand we have the estimated $28 trillion in lost revenue for the fossil fuel industry if we tackle climate change. On the other hand, the economic costs of climate change have been estimated to have a mean of $1240 trillion and potentially be as high as $3290 trillion by 2200, much of which would fall disproportionately on the African continent. While those numbers point overwhelming in favour of climate action, they still cannot do real justice to the devastating nature of climate change. As Academics Stand Against Poverty recently pointed out in their call for universities to divest from fossil fuels , “on our present course, climate change will wipe out crucial gains in development and poverty reduction in the global South, and will trigger food shortages, conflict, epidemic disease, and mass displacement”. Their article cited the Intergovernmental Panel on Climate Change (IPCC), which has shown that climate change will “exacerbate multidimensional poverty” and “create new poverty pockets” in low- and middle-income countries. The scale of this is worrying. As the UN Human Development Report points out, climate change and other environmental disasters could push more than 3 billion people into extreme poverty by 2050 if no significant steps are taken to tackle the problem. We still have the opportunity to avoid this possibility by embracing the clean energy future, thus ensuring a more affordable, environmentally sound, job creating and safe future for the African continent. It’s no wonder then that the IPCC and the Deep Decarbonisation Pathways Project agree that “deeply reducing greenhouse gas emissions and achieving socio-economic development are not mutually exclusive. [Rather] robust economic growth and rising prosperity are consistent with the objective of deep decarbonisation. They form two sides of the same coin and must be pursued together as part of sustainable development”.